The newborn screening would detect the baby was a carrier of any Krabbe mutation. Have you notified your state legislatures about adding the test to the newborn screen in your state? Here's the link. Click and go, don't wait. ITS TIME WE START SAVINGS SOME LIVES. 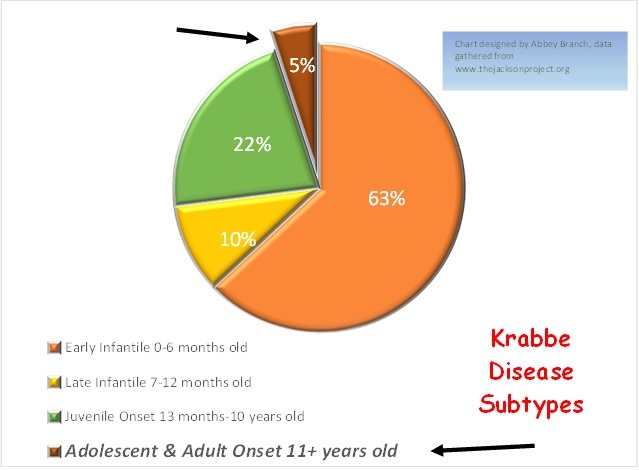 As mentioned previously, there are over 200 known mutations of Krabbe Disease. One out of 150 people carry a mutation, so chances are you know several people that are carriers. For instance, in my hometown of roughly 25,000 people (Burlington, Iowa), about 165 people are carriers of the Krabbe mutation and probably are not aware. There has been a lot of emphasis on my son's type of mutation, which falls under the phenotype of "early infantile." But, I wanted to shed some light on the other categories. The child appears completely normal until anytime after 11 years old. At that time, he/she may be misdiagnosed as having multiple sclerosis: Adult-Onset Krabbe Disease often results in initial vision problems, generally followed by muscle stiffness and difficulty walking (www.huntershope.org). In a few cases, the individual was simply considered "clumsy" always tripping over his/her feet and walking with a slight limp. Symptoms in one case did not begin until the individual was 57 years old. (http://jnnp.bmj.com/content/72/5/635.full). Treatment for individuals with the adult-onset Krabbe mutation may benefit from undergoing a stem-cell transplant if neurological symptoms have not begun.